The first command, Get-SPBusinessDataCatalogMetadataObject, returns and saves in the $metaStore variable a Catalog metadata object relevant to your web application accessible through the url http://yourWebAppUrl. The second command, Import-SPBusinessDataCatalogModel, imports a Business Data Connectivity Model defined in a file, path of which is indicated by the -Path key. The model is to be added to the Catalog referenced by the $metaStore and overwrites the existent version (if any) due to the -Force key. I’ve implemented a few classes to simplify an access to BDC meta data and values from external data sources. 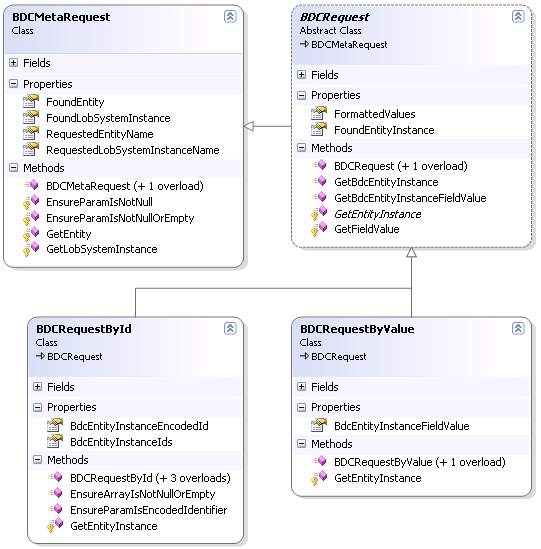 By means of these classes you can make request for values from external data source, using a BDC Entity Instance identifier(s) or a value of a certain BDC Entity field. The root class BDCMetaRequest allows to interact with BDC as a meta data store. 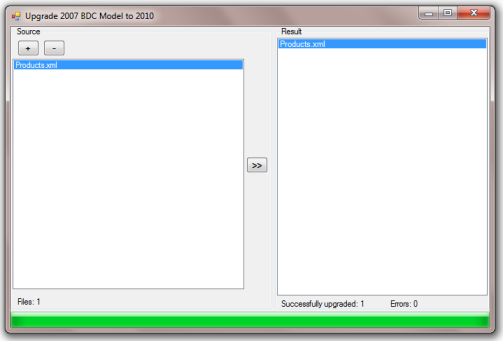 The main goal of the BDCMetaRequest is to get a meta descriptor of a certain external data type registered in BDC. The found descriptor is an object of the Entity class and can be accessed through the FoundEntity property. *Note that all classes described in this post actively use the lazy loading, so the searching for external data item will be performed only if it hasn’t been found before. As I mentioned above, the derived classes BDCRequestById and BDCRequestByValue are responsible for different search criteria and criteria-specific search implementation. The BDCRequestById accepts the identifier(s) of a sought-for BDC Entity Instance in the form of an encoded string or array of objects. While the BDCRequestByValue accepts a value, which will be applied to the first available BDC Entity filter (WildcardFilter or ComparisonFilter). 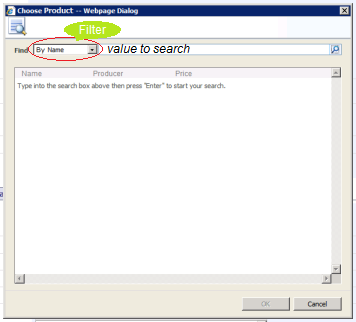 BDCRequestByValue acts just as the user who, interacting with Picker Dialog, chooses the filter, types the required value in the proper text field and presses the Search button (see picture below). /// Represents search of data item in external data source by basing on a certain field value. There is an ability to get formatted values by setting FormattedValues = true, however, complex formatting slows performance, so use it only if really necessary.